Valentines Day is coming…..and do I have some wonderful ideas to share with you! You can’t go wrong with this one because who doesn’t drink from a mug at some point!? And what better way to drink your choice of beverage than to do it in a mug engraved with a personalized message that has been passed down from your loved one! Be creative and have fun! Buy your choice of mug, preferably a white one for clarity and write/draw your love message with a sharpie (oil-based to prevent the longevity of your writing.) You can be as corny/sarcastic or as sentimental/sweet. Set and turn the oven to 360 degrees F (180 deg C.) Immediately place the engraved mug in the oven, while the oven is preheating. Allow the mug to bake for 30 minutes. Set it to cool and pop it out. Doing so the writing becomes permanent! A Box Full Of Love! It’s always great fun to receive a box full of goodies! This simple and fun DIY will make your significant other so ecstatic because it can be quirky yet so personal that it sure will reminiscent him of the good times you have had together and will hopefully have together! Fist take a bunch of notecards at once and draw out a heart on the very top notecard and then cut the heart shape out through all the notecards intact underneath it. 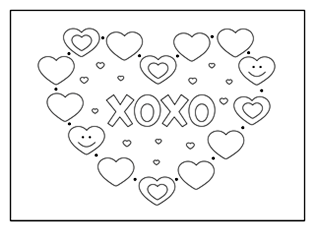 This will result in loads of heart shaped cut-outs all at once. Cut as many as you like. It’s Valentine after all, so go crazy! I then used different colored sharpies to color out all my hearts and left cute messages on them for my man to read. So, you just take a tiny piece of paper, write down your special message and roll it up, tying it with a red thread to complete the look. These are really fun to make and follow up with because it always adds a bit of spice and kick in your relationship! Cut your preferable size of love ticket and decorate it as you please. I did a romantic dinner, breakfast in bed, body massage, and free wish. Be as inventive and personal and I’m sure he will make good use of it! These are simply fun to look at and keep. Cut a piece of paper and fold it in half. Apply your choice of lipstick and imprint your kiss on the inside of the paper. It’s that simple and cute! Wrap up his favorite chocolates and he will surely thank you for that! These are completely optional but you could go the extra step and pep it up with a necklace/ring/bracelet. This would be the surprise he would not expect! Chocolate rules, but I like the coupons idea, too. All of them are cute! Of course! I am a major chocoholic! But I control myself, contrary to him. hahahaha…Wasn’t it recently National Choolate Day? It was, sure, and it should be every day! Didn’t you know that chocolate is the most dietetic and healthiest food in the world? There is this joke that chocolate contains all four food groups, but really, semi-sweet dark chocolate is very healthy for heart and brain. Love that mug! It’s hard to find things for hubbies – this is great! The dollar stores usually carry the white mugs. Isn’t it so cute! I absolutely love it Kelley! loved it Laura! Thank you!! !